In a medium glass mixing bowl, whisk together egg white, rice wine, cornstarch and salt until thoroughly combined. Add strips of beef and toss to combine. Marinate for about 30 minutes in the refrigerator. In a separate bowl, whisk together beef stock, oyster sauce, rice wine, soy sauce, brown sugar and sesame oil. Vigorously whisk in cornstarch until smooth. Set aside. Heat oil to medium-high in a large skillet or wok. In batches, sauté marinated beef strips for 1-2 minutes, flipping once, until browned and crispy on all edges. Remove cooked beef and place on a paper towel-lined plate. Add broccoli florets to the hot skillet or wok and sauté 3-4 minutes, until just tender, stirring frequently. Stir in ginger and garlic and sauté an additional 30-60 seconds. Pour sauce into the wok or skillet and simmer 1-2 minutes, until thickened. 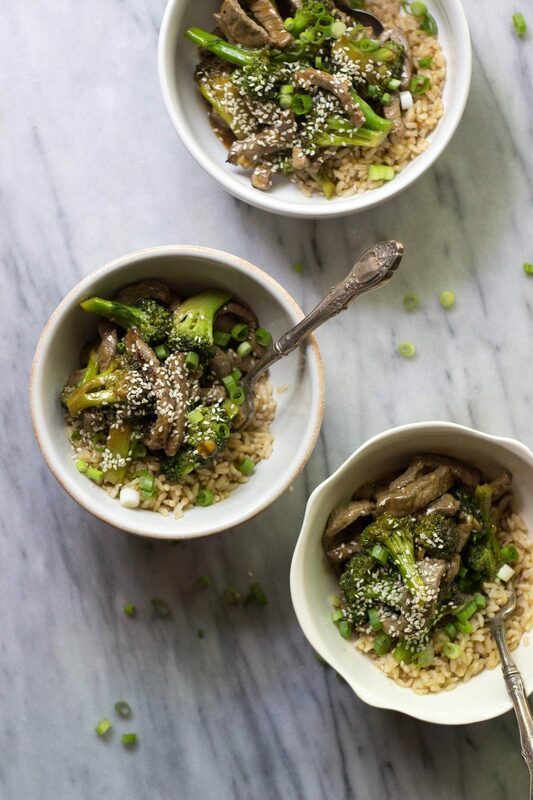 Serve beef and broccoli over cooked rice and top with sesame seeds and green onion.